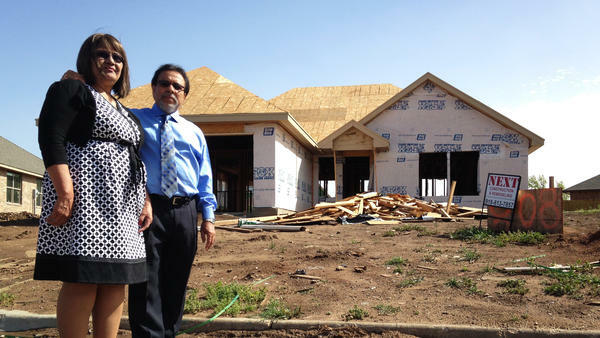 Gloria and Francisco Sanchez stand in front of their new ranch house, still under construction a year after a tornado destroyed their last home in Moore, Okla.
Mario Medrano of the American Red Cross speaks to an attendee about tornado safety at the Children's Day Festival in Oklahoma City. "Here you go!" she tells a young visitor to the Red Cross table before turning to his mother and asking in Spanish: "Do you have a tornado plan yet?" Preparing for tornadoes was not always on the top of Cruz's agenda. "I come from Puerto Rico," she says. "Talk to me about hurricanes — I'm an expert." That was one part of life in Oklahoma that took getting used to after Cruz moved to the state almost a decade ago. She says she filled in the gaps of her disaster preparedness knowledge by volunteering with the Red Cross. 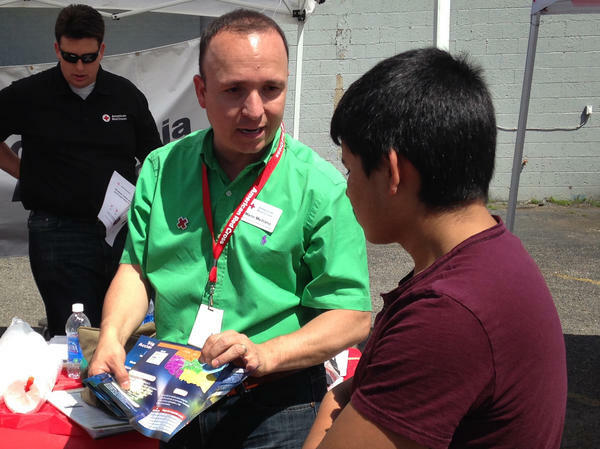 The local Red Cross chapter recently hired two bilingual staffers to increase Hispanic outreach. Cruz says there's more work to do. A year after the devastating round of tornadoes, she says there are still many Latino residents who are not prepared. "When you ask them if they have a plan, they [say], 'Yeah! Kind of!' " she adds. Last year, Gloria Sanchez didn't have much of a plan — or a storm shelter. When she heard the roaring tornado headed for her neighborhood in Moore, Okla., she decided to seek refuge at the local hospital. "God helped me a lot, because I made it to the hospital," she explains as tears streak her face. Winds whipped through the shattered windows of the hospital cafeteria where Sanchez huddled on her knees until the storm passed. When she finally made it back to her home that evening, all she could see was the floor of her home and mounds of broken bricks and two-by-fours. The debris has been cleared away to build a new ranch house — one that, Sanchez says, will definitely include a storm shelter out back. In the meantime, Sanchez and her husband Francisco live in a rental home in Oklahoma City, waiting to return to Moore. In a cramped bedroom of their temporary apartment in Oklahoma City, the two flip through an activity book with tornado safety tips. Disaster preparedness has become a frequent topic of conversation for Amelia and her daughter, who often reads the activity book to help her sleep at night — so many times that the cover has started falling off. Last May, Amelia rushed to pick up her daughter from school. When Amelia arrived, she remembers, Jocelyn said, "Mama, I'm hungry! I'm thirsty!" But Amelia only had her keys and some documents with her. "This year, it's so different. I have my bag ready," says Amelia, who recently went shopping for water bottles, snacks and toiletries to stock her emergency kit. Amelia says she has also mapped out a network of friends nearby with storm shelters, and she's paying close attention to weather reports on the local Telemundo station, which recently hired its first Spanish-language meteorologist. 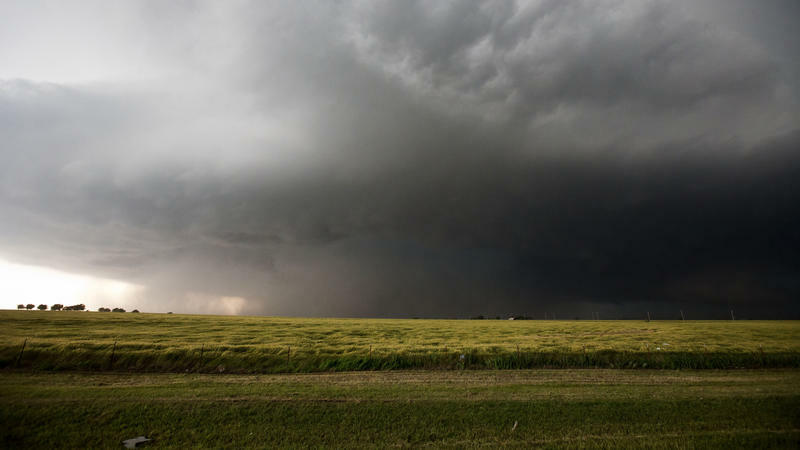 A recent report by the National Weather Service cited limited sources of Spanish-language information as one of the main reasons why last year's storms affected many Latino families, including the seven victims of the May 31 tornado who took shelter in a storm drain. "They didn't die from the tornadoes. The ditches filled up with water, and they drowned," says Ruben Aragon, president and CEO of the Latino Community Development Agency in Oklahoma City. "They didn't drown because of the tornado. They drowned because of misinformation." Aragon adds that the storms served as an urgent reminder to local officials about the changing demographics of Oklahoma City, home to one of the country's fastest-growing Hispanic populations. The community has almost doubled over the past decade to more than 100,000. According to the Pew Research Center's Hispanic Trends Project, at least 42,000 Latino residents in Oklahoma City do not speak English very well. "Sometimes if it doesn't hit you over the head, you don't feel it. The tornado hit us over the head, and very hard," Aragon says. Back at the Children's Day Festival, children line up by the American Red Cross table for red balloons and Tootsie Rolls as Cruz stops passersby one by one. She urges them to prepare emergency kits — with some success after approaching one particular festival attendee. "He said, 'You know what? I started preparing my kit. I put this and this and this.' I was like, 'I'm proud of you!' " Cruz exclaims. "I was so happy!" So happy, she adds, that she gave him a high-five. And just 11 days after that tornado ripped through Moore last May, another twister ravaged the suburbs of Oklahoma City. Nine of the 23 who died that day were members of the local Latino community. Now there are efforts to better prepare Spanish speaking families for future storms. Hansi Lo Wang of NPR's Code Switch team saw that in action at a recent fair. HANSI LO WANG, BYLINE: Volunteer Ivelisse Cruz greets a shy, young visitor to the American Red Cross table at the Children's Day Festival in Oklahoma City. Taco trucks are parked nearby, close to a raffle for a free storm shelter. Cruz hands out stickers to children, while keeping a close eye on their parents. WANG: For Cruz, getting Spanish-speaking residents to plan for the next tornado tops this morning's agenda. : I come from Puerto Rico. Talk to me about hurricanes, I'm an expert. But tornadoes? WANG: That was one part of Oklahoma life that took getting used to after Cruz moved here almost a decade ago. Recently, the local Red Cross chapter hired two bilingual staffers to increase their Spanish-language outreach. And Cruz says there's more work to do. We have a lot of people that still after a year of the last tornadoes, still don't know what to do. No clue - nothing. And when you ask them if they have a plan, they are saying: Yeah, kind of. Last year, Gloria Sanchez didn't have much of a plan or a storm shelter. When she heard the roaring tornado headed for her neighborhood, she decided to seek refuge at the local hospital. GLORIA SANCHEZ: God, I don't know, God helped me a lot. Because I made it to the hospital, you know? SANCHEZ: It was all on the floor. WANG: You just saw the floor. SANCHEZ: On the floor, everything, and the debris on top. WANG: One year later, the mounds of crumbled brick and broken 2x4s have been cleared away to build a new ranch house, one that Sanchez says will definitely include a storm shelter out back. JOCELYN: And the next thing is tornado safety, which nobody likes that. But it tells me what to do. WANG: In a cramped bedroom, Jocelyn and her mother Amelia flip through an activity book with tornado safety tips. We're not using their last name because Amelia fears deportation as an undocumented immigrant. Before, would you talk about tornadoes? WANG: Amelia took cover under a bridge last May after she rushed to pick up her daughter from Plaza Towers Elementary School. AMELIA: Last year, just take my keys and my papers and go. When I take her, she say: Yah, Mama. I'm hungry. I'm thirsty. I don't take nothing, you know? But this year it's so different. I have my bag ready. WANG: ...which recently hired its first Spanish-language meteorologist. Still, a recent report by the National Weather Service cited the limited sources of Spanish-language information as one of the main reasons why last year's storms affected many Latino families, including seven victims from the May 31st tornado who took shelter in a storm drain. RUBEN ARAGON: They didn't die from the tornadoes. The ditches filled up with water and they drowned. They didn't drown because of the tornado. They drowned because of misinformation. WANG: Ruben Aragon, president and CEO of the Latino Community Development Agency, says the storms reminded local officials about the changing demographics of Oklahoma City, home to one the country's fastest-growing Hispanic populations. It's almost doubled over the past decade. ARAGON: Sometimes if it doesn't hit you over the head, you don't feel it. OK? The tornado hit us over the head and very hard. : You want a balloon? ARAGON: Back at the American Red Cross table, children line up for giveaways as volunteer Ivelisse Cruz stops passersby one by one, urging them to prepare emergency kits with some success. : And he said: You know what? I start preparing my kit. I put this and this and this. I was like, I'm proud of you. So he was just missing the whistle. So, like, here you go - put it in the bag. I was so happy. WANG: So happy, she says, that she gave him a high-five. Hansi Lo Wang, NPR News. MONTAGNE: And thanks for making NPR News part of your daily routine. You can stay with us throughout the day. Tune in later for ALL THINGS CONSIDERED. A day after a line of severe storms spawned tornadoes blamed for the death of at least 15 people in Arkansas and Oklahoma, the South was raked again. This time, Mississippi and Alabama were hard hit. -- Why do storm chasers do what they do? -- Do the benefits outweigh the dangers?